Less than a year since fundraising began, a campaign to honor veterans with a memorial in Sun City Center has already raised $134,000. “We started last September but had problems because of Hurricane Irma, so technically we have only been collecting since December. It’s amazing,” said Walt Cawein, president of the SCC Charitable Foundation, which is sponsoring the memorial. Organizers are selling engraved bricks in two sizes: $100 for a 4-inch square and $200 for an 8-inch square with an additional $15 for a military seal. The bricks will form a pathway surrounding the monument in front of the Sun City Center Community Hall, 1910 Pebble Beach Blvd. 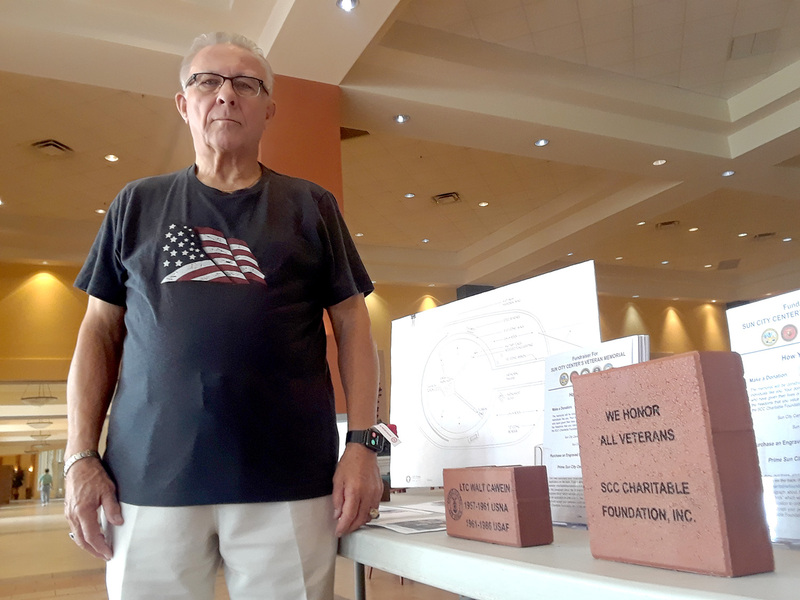 S. “We have already sold 342 bricks,” said Cawein as he manned a booth promoting the campaign at the Kings Point Veterans Theater on Memorial Day. The black granite base for the memorial is about to be shipped from India, one of only three countries — China and Zimbabwe are the others — that sell the special rock. A 6-foot eagle will sit atop the 5-foot granite base. “Hopefully it arrives in two months and we have it down in time for our dedication in the first week of November,” Cawein said. Bricks can be purchased, or donations made online at www.charitablefoundationscc.org, or email waltcawein@gmail.com for more information. Walt Cawein, president of the Sun City Center Charitable Foundation, hopes to see a ground-breaking ceremony for a proposed veterans memorial at Community Hall in late June or early July.